My trade was closed by SL and yours did not, why? My trade result is different from yours, why? HELP CATEGORY: PROBLEMS > TRADING ERRORS > My trade was closed by SL and yours did not, why? My trade closed with SL and yours didn't, why? The very first thing which could have come to your mind - Signalator is cheating. But this is just not true and is not the case. Signalator undertakes all possible steps to remain transparent, honest and reliable. Please read the following article. It explains in detail why situations like the one you have faced happen. When you open a trade with your forex broker, it is you broker who give you an execution price. Unlike any stock exchange, the FOREX is decentralised market with multiply levels of price access. Every time you make a trade, your broker decides which price to offer to you. Moreover, there are always two prices: Bid (if you sell or close a buy trade) and Ask (if you buy or close a sell trade). Each broker has its own price feed. You can simply check it by opening several accounts with various brokers simultaneously. In rare cases, price come very close or just exactly at the level of SL (in 75% of cases it happens with sell trades). In this situation, you can't really know whether your broker closes a trade or not. Please note: if you have a sell trade, then you have to check an ASK price of your broker. Moreover, this is exactly the moment, where the level of spread plays the most important role. Spread levels are not only affected by various brokers but also by an account type. Most demo accounts and small accounts (less than $1,000) have worse prices. Signalator has accounts with various brokers. We do also host clients trading platform and we can monitor, how positions are executed through a number of brokers. If we have at least 25% of broker accounts not closed by SL, we consider that kind of trade as an open one. If you use the guaranteed pips subscription and your trade was closed by SL, we will update your pips balance to reflect the net profits. To give more information about Signalator trading results, we indicate the trades which were closed by SL by some brokers. To illustrate the above mentioned situation, we have prepared the following example. On the 2nd of September 2016, we made a trade for the USD CAD XT signal. We opened a Buy trade at 13:47 at 1.3025 with SL level of 1.2987 (Position ID: 12886; Alert ID: 36932). You may check this trade either on USD CAD XT detailed results page or the Signals History page within your personal page. 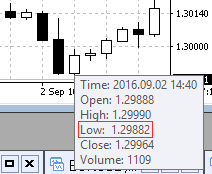 As you can see, one hour later, the trade was closed by SL for Broker X as it has the Low price just 0.00003 lower. 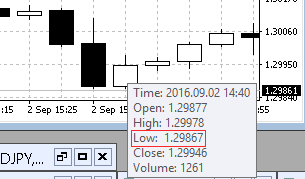 However, the Low price for the Broker Y was 1.29882 (which is 1.2 pips higher than the SL level was). As SL was not hit for more than 25% of different brokers, we did not consider the trade as closed and then we closed it by market at 15:44 with 6 pips profit at 1.3031. So within the results of Signalator is +6 pips whilst within your trade account, it could be a SL for -38 pips. Signalator cannot influence this situation at all. Moreover, when / if it happens again, the Broker X may have better price than the Broker Y. Therefore, if for some reason you faced the problem of a trade closed by SL whilst Signalator trade was not closed by SL, there is no need to change your broker immediately. However, if you face too many instances of the problem, it is the time to consider a change.